This is a representation of the TLIO Newsletter No 10. To simulate the layout of the Newsletter I”ve made heavy use of tables and assumed a resolution of 800×600 which may cause problems for text-only and some older browsers. For a minimal format, .txt version click news10.txt. Eigg throws off feudal yoke ? ……the inhabitants of Eigg today, like those of so much of Scotland, have legal status akin only to nuisance value in matters of real estate.. ?A collector?s item? is how one laird described the Isle of Eigg to me recently. A collector?s item, indeed, which can be bought and sold without reference to the interests of those whose lives paint their meaning here….” Alastair McIntosh, Isle of Eigg Trust, speaking in 1995 Taking ownership of the island of Eigg on the 12th of June was a glorious day of celebration, with the islands population of 68 being joined by 350 friends and supporters. The island is now officially owned by the Isle of Eigg Heritage Trust (a limited company by guarantee with charitable status),which consists of 3 partners :the Eigg Residents Association (who have 4 elected representatives), the Highland Council (2 representatives) and the Scottish Wildlife Trust (2 representatives). The main aim of the trust is to promote opportunities for sustainable development, without detriment to the islands unique culture and natural heritage. The first priority is to ensure that all existing residents have full security of tenure on the houses they live in, the land they farm and the business premises which they work from, something that was denied to many by previous owners. In the longer term there are plans to re-establish the estate farm, planting hardwoods and fencing to encourage natural regeneration, and to build a 20 bed low-budget hostel. For further information : Contact Maggie Fyffe, Isle of Eigg, PH42 4RL. Help us make a difference We need volunteers to work on research, admin, action planning and support, either from home or in Oxford. General and travel expenses will be covered. Specific roles include: ? Fund-raiser to get grants ? Lobbyists to implement long term strategy (call Dan Bloomfield 0181 785 3014) ? Rural Settlement Forum co-ordinator (call Mike Fisher 01256 771477). ? Web site co-ordinators We also need: archive material of actions – artwork for publications, display boards, and newsletter – demos of your land inspired poetry, songs and music for our Land Songs tape – tarpaulins – transport (access to a minibus/van) – video footage of St George?s Hill, Wandsworth, Easter Garden and low impact development, illustrating TLIO?s aims and objectives . Campaigning News Central Stoke-on-Trent: The Packmoor Action Group are continuing their campaign against the activities of ?English Partnerships? – see back page. Contact: Jan Bridges 01782 851842. Exodus Collective, Luton, Beds: The defeat at the election of notorious traveller basher John Cartwright MP could herald a new era of official understanding of the collective. The test will be a forthcoming High Court hearing to decide whether the collective have the right to continue the tenancy of their farm. If Exodus lose they stand to be evicted on Christmas Day. Send supportive letters to the new local Labour MP Kelvin Hopkins at the House of Commons. Contact the Collective at: 01582 508936. East Kent, Folkestone: Local residents lost their appeal against the 850-building ?Holiday Village? which is planned to be built on Lyminge Forest, and protest camps have been set up. EVICTIONS COULD BE HAPPENING ANY TIME! To lend a hand (people, tarpaulins, food, blankets etc always needed) call 01227 261057 or 01303 862722. North Newcastle-Upon Tyne: Newcastle United?s plans to build a 55,000 seat stadium on Town Moor land are still being fought by the No Business on the Moor campaign. They are preparing a case at present to go to council in Autumn. Contact: John Griffiths on 0191 232 2809. York, Naburn Woods: Developers now have planning permission to build a shopping village, but have included token gestures, such as recycling facilities, and a new colour of brickwork, to soften the blow. Building of the access road has started – future actions are being considered . Contact Ben Priestman 01904 410185. Scotland Edinburgh: Calton Hill. Campaign to stop Edinburgh City council transforming the beautiful Calton Hill into a mega tourist trap using Heritage Lottery Fund money. Illustrating the unaccountability of both city council planning policy and lottery grants. Contact Nick Fiddes: 0131 4473479 or caltonhill@clan.com.uk. Buildings in the Forest: Innovative project being co-ordinated by Reforesting Scotland, restoring the land to the people and the people to the land by creating entire living systems based in forests/woodland which can be ecologically, socially and economically sustainable. An ecological building is being constructed in Pishwanton to act as a focus for green events. RFS are bringing out a handbook in November for Scottish communities wishing to be involved in decsion processes for their forests and have a gathering in the borders 3rd-5th October. Contact Reforesting Scotland: 0131 2262496, 21a Coates Cres, Edinburgh EH3 7AF. South Brighton Urban Design and Development: Sainsbury?s are persisting with plans to put an unnecessary supermarket, cramped housing and 325 car spaces on the old goods-yard by the main railway station. Brighton council are afraid of having to pay a massive appeal costs bill if they reject the unpopular plans. Hundreds of local residents voiced objections at a hastily convened meeting last month. Three people supported Sainsburys. To add to the pressure on the council there is now an even more monstrous proposal for a Singapore style retail/leisure complex. As a local planning officer said: ?Brighton is a unique town with its own style and identity. Development should respect that rather than smother it.? A number of groups have formed the Stop the Store Alliance. The alliance want to put in a sustainable community planning application which responds to local needs and BUDD want to hear from anyone with energy or experience. Meetings every Thursda y evening. Contact Ben or Jenny 01273 622727 London Angelltown Community Project: A community based project emerging from a tenants association of the Angell town estate in Brixton. They have converted a disused car park into an enterprise centre which includes workshop space, cafe, club room and a recording studio. Their project is designed at renovating unused and unattractive land. Last year two groups of children designed and created their own landscapes on derelict sites in the area. Can offer advice to anyone who wishes to embark on similar projects. Contact: 0171 7377977. Wales Wales against opencast: There are still camps at Nant Helyn, which is going to public inquiry on November 25th, and at Bryn Gwyddel between Aberdare and Merthyr which need support. Adjacent to Bryn Gwyddel is a landfill site relocated from the Rhondda where it was alleged to have caused birth defects. Contact: Eric 01685 873993. Cardiff Bay: Labour Welsh Secretary and Ministers have made a searingly quick change of mind upon entering the chaste and exclusive power broking halls of the Welsh O ffice. In opposition Ron Davies, Peter Hain and Win Griffiths all fiercely criticised the plan to flood internationally important mudflats to create a waterfront development and marina. They have now approved the scheme via a secretive review procedure, and only now have agreed to meet with local residents and environmental groups. Contact: Friends of the Earth Cymru 01222 229577. West Bristol Ashton Court: ACTION!! on August 26th against plans to extend a quarry 20 acres over unimproved wildflower meadow. Meet 8 pm at Dunford Quarry, Longford Lane, Bristol. Contact: Bristol FOE on 0117 942 0129. Somerset: (near Yeovil) Tinkers Bubble. The bathhouse is near completion and they are now selling sustainably produced timber. They still however face a £15,000 bill for taking their case to the European Courts of Human Rights. Any help with paying off this bill appreciated. Contact 01935 881975 Plants for a Future: who had plans for an eco-village in Cornwall have now bought 83 acres of land and have submitted an outline plan by eco-architects Gail and Snowden to the council. Depending on the outcome, they hope to move onto the land in October. Check out website with useful plants database (axis-net.com/pfaf/plants.html). Contact: 01208 873554/623. International Botswana: Kalahari People Fight For Their Land In early June around 300 people were moved from Xade in the Kalahari Game Reserve to a new settlement in a ?wildlife management area?. It is unclear whether they will have any right or control over their new land. ?Those who are leaving, are leaving in sorrow; those who are staying, are staying in sorrow.? Survival International: 0171 242 1441. Aboriginal Land Rights – There have been protests about a new uranium mine opened in the Northern Territory of Australia on Aboriginal land. Gundjhemi Aboriginal Corporation wants uranium mining in Australia closed down, not further expanded and demonstrated outside gates of the Ranger uranium site: messages of solidarity to GAC: jacq@taunet.net.au Brazil– Brazil Network have produced a film ?The March for Land? about the Brazilian Landless movements- MST- march to the capital. Contact TLIO office around end of August. Local Groups BRISTOL: Contact Gordon Franks, 0117 965 6261 x3189. CORNWALL: Progress at forming the group has been slow, but enthusiasm remains. Contact: Margarita, Box 26, Saltash, PL12 6XY. DEVON: Contact David Osbiston, 01647 433684. There are currently 4 or 5 people, who are busy thinking but are not currently holding meetings. Projects on the go include trying to set up a local low impact development building; mapping land use and land ownership; signing a petition against a housing development and developing a band to play land songs. EAST ANGLIA: Contact Judy Say, 01787 371886. Lots of enthusiasm at last meeting, held at end of July by Sudbury group members, to put energy into stimulating rest of our region. It was decided that we would organise a meeting first in Essex in Colchester, and then if this was successful organise meetings in Norfolk and Cambridgeshire, with a view to there being a local group formed in each county. This will asist in networking information and action when needed. National Mailing list is to be used as contact names and publicise to other alternative groups. Two sub committees are researching derelict land and acquiring land for sustainable, low impact living. Will follow-up our surprise appearance on Crossquestions TV programme with a local petition on this issue to be presented to our MP Tim Yeo. Next Sudbury Group meeting 26th August 7.30, 2 Peacocks Lea, Ca vendish, Suffolk (tel: Christine on 01787 281833 for directions) September meeting on the 25th at 7:30 at 20 Essex Avenue, Sudbury, Suffolk tel: 01787 880694 for directions. HAMPSHIRE: Local opposition to Eagle Star?s proposed Micheldever new town has taken a new turn after an inspectors report on the local plan suggested it was an appropriate route to meeting Hampshire?s perceived housing needs. Local group contact: Mike Fisher: 01256 771477. HULL: Contact Mace, 01482 218377. KENT: Contact Richard Moyse, 01795 890558. The Kent group is literally just starting up but will hopefully soon be active. Contact us if you live in the area! LONDON: Meeting early September. Contact Jo Norcup, 0956 651580. OXFORD: Contact 01865 722016. SHEFFIELD: Group will be represented at CHAR/Permaculture conference in Sheffield, 24-25 September. Contact John Barnabus, 0114 243 8035 SOMERSET: Contact Matt Reed, 01460 64500. SOUTH WALES: Contact Mike Jacob, 01633 875627. Torfaen/Cwmbran, Fight the Plan: Torfaen community planning day brought local people, activists and a Torfaen Council planner together, to discuss and question policy over opencast mining and new housing development. The AGM of ?Fight The Plan? is on 17th September; the group is continuing its research into the case against the local plan, in preparation for the public enquiry in March. They have also produced a postcard of the threatened site, to send to Ron Davies (Welsh Secretary) in protest. TYNESIDE: Contact George French, 01434 600782 WARWICKSHIRE: Contact Yasmin Frings, 01203 353238. NORTH YORKSHIRE: Contact Michael Gresham, 01723 882289. DIARY Sat 20th and Sun 21st September: Mass Trespass and occupation, Oxfordshire. For the right to roam on all uncultivated land. Overnight camp and nature trail on the ?property? 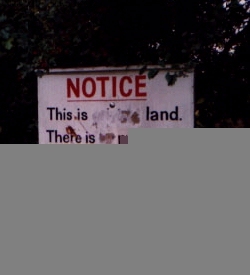 of a particularly offensive landowner. We will be joined by veterans of the 1932 mass trespass on Kinder Scout in the Peak District. Meet Saturday 10am in the concourse of Oxford railway station. Friday night accommodation available in Oxford, come to the TLIO office in St. Michael?s Street 7-8pm Friday evening or call the mobile 0402 176410. Camp location will be on the office answerphone (01865 722016) from 11.30am Saturday. Bring tent, food, camcorder or camera if you have one, also sleeping bag and mobile phones. Basic cooking facilities on site. Weekend 5th-7th September: The Alternative Media Gathering. East Oxford Community Centre. Organised by Undercurrents, New Internationalist and Corporate Watch to establish stronger relations between social justice campaigners using alternative media. contact: Paul or Chris 01865 791391 or 721366 eve. Sunday 28th September Ramblers Association Access Day. Nationwide day of organised walks highlighting the value of public access to open country. SAE to Nicky Warden, Ramblers Association, 1-5 Wandsworth Road, London SW8 2XX or call 0171 582 6878. Weekend 3rd – 5th October: Low Impact Group weekend party, Birch-Hill wood, nr Leicester. Group tasks in the woodland and more – bring food and your own ?structure? . Camping in communal chicken-shed. Meeting Sat. 4th October at 2 pm. Contact Lisa Yates 01254 234228 Sat 18th to Mon. 20th October TLIO convergence, Keveral Farm, Cornwall. At our last get-together back in May TLIO decided it would be a good idea to have two national convergences a year. We now have about 20 local groups and this is the opportunity to get to know each other. To make sure we don?t all get burnt out we?ll be staying for an extra day to relax & maybe explore some of the local countryside. More details in the next newsletter. Thu 23rd to Sun 26th October Free 4 day TLIO Yurt making course, Tinkers Bubble, Somerset. Learn how to make this Mongolian low-impact structure with other TLIO supporters. The only charge is £4.00 per day for meals. At the end of the course we aim to complete a 16″ TLIO Yurt for future festivals and actions. Parking limited – we will arra nge pick ups from Yeovil Station. Contact the Networking office to ride-share and book places. 20th October to 16th November The Putney Debates. Commemorating 350 years since Cromwell sat round the table in Putney Church with the people to discuss the future Constitution. If you are interested in contributing call TLIO mobile 0402 176410. Friday 31 October ?Halloween treat for Opencasters? Huge Opencast Action to close down an opencast site ? action throughout the country & in Australia . Contact: No Opencast, 0171 603 1831. Policy Developments Organic Farming: It looks like there will be a review of policy towards organic farming. It may be positive in making the system more supportive while farmers convert to organic production. But proposing a review which does not interrogate wider structures which frame agriculture will make it only tinker at the edges. Roads Review: the review published recently means that some nasty projects, notably the Salisbury bypass, will be shelved. The review still however has the malodorous influence of the British Roads Federation about it. The North Birmingham relief road, which was opposed by many ministers in oppositio n, looks likely to go ahead. Open cast review: A new consultation paper, ?Opencast Coal, Review of Planning Policy Consultation Paper?, could herald tough new controls on opencast. Most important is the presumption against open-cast has been reintroduced. All community and environmental groups are encouraged to respond. Ask your MP for a copy! Right to Roam: The government is still in consultation regarding the upcoming paper on access to land . Take part by writing to Michael Meacher MP, Dept of the Environment. CAP reform: Just five years after the last reform of the Common Agricultural Policy, the European Union is under pressure to make further changes. One of the key ideas being proposed is ?cross-compliance? ? linking payment of subsidy to environmental performance and changing the role of farmers from food-producers to countryside managers. Whether this would work is doubtful: even if the agro-chemical giants let it happen, the best we are likely to get is a heritage theme-park version of the countryside. What is not being challenged is the right of all farmers to receive subsidies in the first place. Benefits claimants are made to feel guilty, while the agriculture industry can feed sheep guts to cattle, and then be compensated when no-one wants to eat beef anymore. It is subsidies which have allowed large farms to become huge farms, turned food-production into a profit-driven industry, and caused the catastrophic decline in agricultural employment since the war. Only with substantial changes to our economic and social structures ? including the abandonment of CAP ? will we see a return to a living, working, and repopulated countryside. Tall Stories English Partnerships and Urban Regeneration: The new Stoke-on-Trent Unitary Authority is hell-bent on developing every green site in the City with the ?help? of English Partnerships. These reclaimed industrial sites have been used as public open space for more than 30 years, with abundant wildlife, trees and important meadowland. Developers are turning their greedy eyes on these sites, which are seen as ?brownfield? even though some have not been industrial sites for a century. Disturbing these sites will release toxic flue dusts that could disperse for miles. When residents associations presented the results of independent tests to the Council, they were simply told that the decontamination of the land would be the responsibility of the developers. These companies will be able to bu y the land at a knock-down price because of its inherent problems, do nothing to it, develop it and then take the money and run, leaving local communities with no open space, no amenities and large residential or industrial sites that nobody wants after the 10 year NHBC guarantee has run out. Jan Bridges Cost of Traveller Evictions: The Telephone Legal Advice Service For Travellers have been researching the financial cost of evictions. Doncaster council , for example, estimated that a high profile eviction ?Operation Exodus? cost six figures – illustrating the discrepancy between the amount of money spent harrassing travellers and the cost of formulating reasonable attitudes and policy towards itinerants. TLAST welcomes any data or info: TLAST, Cardiff Law School, PO Box 427, Cardiff. Publications and stock for sale: a taster Charter for the Countryside, George Monbiot, £1. Diggers and Dreamers 96/97, guide to co-operative living, £9.50. Do or Die: Voices from Earth First! 1997, £1.80. TLIO information pack, aims and objectives, 50p. TLIO T-shirts. XL, L, M, S, unbleached cotton with TLIO logo on the front and Winstanley quote on the back, £7.50/£6. Low Impact News issues 8-10, £2. Permaculture : a new app roach for rural planning, Rob Hoskins, £9. Progress and Poverty, Henry George explains the industrialist/landowner wealth/poverty trap, £5. Road Raging, Road Alert tips for direct action, £3. Squatters Handbook, squatting and the law, £1. Activists? guide to stopping unwanted development, £2. Levellers & the English Revolution, HN Brailsford, £11.50. Send SAE for details of more publications. Cheques payable to ?The Land is Ours?. Donation if poss. Deadline for submissions: Anything you send us for the next issue will be most gratefully received before 25 September 1997. @nticopyright These pages maintained by stevej@dircon.co.uk please contact me with any problems or suggestions concerning this website.